Description: Retired police chief Katherine Sullivan moved away from Edina, Minnesota to feed her artistic soul in New Mexico. But when she receives an urgent call, her serenity is shattered. Nathan Walker, her best friend and former colleague from her days on the police force, is missing and his crew of security experts hasn’t seen him in days. Now it’s up to Katherine to fly home and track him down. Meanwhile, Edina is reeling from the murder of a local woman, which looks more and more like it could have a connection to Nathan's disappearance. And as Katherine digs deeper into the investigation, locating Nathan’s abandoned car and compiling a list of potential kidnappers, another body is found--and Katherine fears time is running out for her friend. Finding herself reluctantly pulled into a new case, Katherine must set aside her artistic pursuits and tear herself away from her darling grandchildren in order to save her best friend in Death in the Abstract, the compelling sequel to Emily Barnes' The Fine Art of Murder. Why I Picked This Book: I loved the premise of police chief turned artist when the first book came out and I couldn't resist this one about a missing person. I love a missing persons case! My Impression: Whew! That was a fun ride I didn't want to end. We meet Katherine Sullivan at her artist community in Taos where she gets a call that a longtime friend and colleague has gone missing. Now I love a missing persons case and this one had me at the edge of my seat. Just what could have happened to Nathan? The clues are scarce and the motives even more so. And just how is this not so simple missing persons case connected to two local murders? I really enjoyed the characters in this mystery. Katherine is an interesting mix of practical and creative. I enjoyed seeing her interactions with her daughter and her grandchildren and it was especially enjoyable as she tried to find her footing with her daughter's ex-husband. Her experience in law enforcement makes her an able and intelligent investigator in addition to being very good at reading people. As well, I enjoyed her work with Nathan's security team and all of their different strengths and skills. E.T., Brock, Rosie, and Polly all have interesting back stories and are characters I'd really like to know more about. The mystery is complex and well done. It focuses more on the whys and hows than the who which is something I always enjoy. This is the 2nd book in the Katherine Sullivan series and while I definitely plan on reading the 1st book I had no problem jumping in here. This was an entertaining and interesting read that kept me thinking. I'm looking forward to more of this series and this author. Would I Read More of this Series/Author? : Absolutely! I'm looking forward to the next book and going back and reading the first in the series. Would I Recommend this Book? : Definitely! 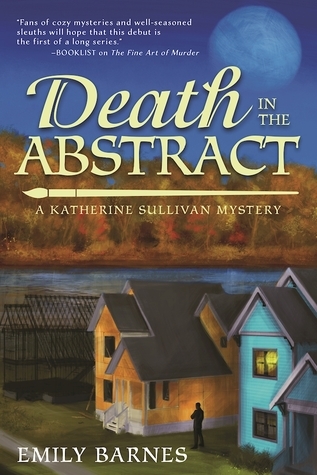 This is a great cozy mystery for any mystery lover. This one really sounds intriguing - thank you for a great review! This does sound good. Nice that she's ex- law enforcement since so many cozies go with the "amateur sleuth" angle. And anytime you can jump into a book two is a good thing. Glad this was great! I like that the mystery is complex Katherine. Glad it works as a standalone! This sounds like a wonderful cosy and I like how Katherine sounds. And the fact the focus is on the whys and hows. Well that does sound fun. And what a jump from police chief to artist. I think that would catch my eye, too. I like the sound of this one. I really like that the main character sounds a bit more mature. It sounds like it was really well done. Great review!